Smithsonian explores America's immigration story through "H-1B"
Photo Courtesy of the Smithsonian Asian Pacific American Center. Washington, Nov 25 (IANS) In a spin-off from the Smithsonian’s “Beyond Bollywood” exhibition, 17 South Asian American and Asian-American artists explore America’s immigration story in a new digital exhibition simply titled “H-1B”. 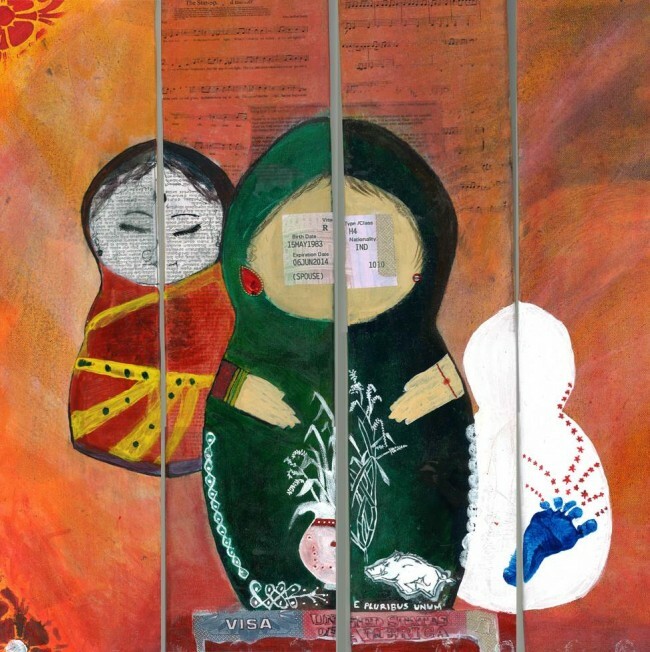 Inspired by the employment visa coveted by Indian techies, the artists comment on their immigration journeys depicting the range of emotions-anxiety, dignity, isolation and opportunity-associated with living in America. Approximately one-third of H-1B visas that permit foreigners highly skilled in science, technology, engineering and mathematics to work in the US on a temporary basis, annually are issued to South Asian workers. “Our H-1B Visa exhibition explores a historic part of the American story from the perspective of South Asian Indians,” said Konrad Ng, director of the Smithsonian Asian Pacific American Centre. The H-1B program has recently come under fire because the demand for H-1B visas has exceeded the 65,000 cap every year since 2003, this year getting 233,000 applications in less than a week. Closely tied is the H-4 visa for dependent spouses and children of H-1B visa holders. “Each year, people from all over the world come to the United States for a better life; some find opportunity, and others endure great hardship,” she said. The Smithsonian Asian Pacific American Centre is also encouraging people to share their H-1B stories using the hashtag #MyH1Bstory.